To be accessible online every site needs a web address. A domain is that web address. After adding theme and content, you need to publish your website to make it live. While publishing your website for the first time, you need to decide and map a domain for it. 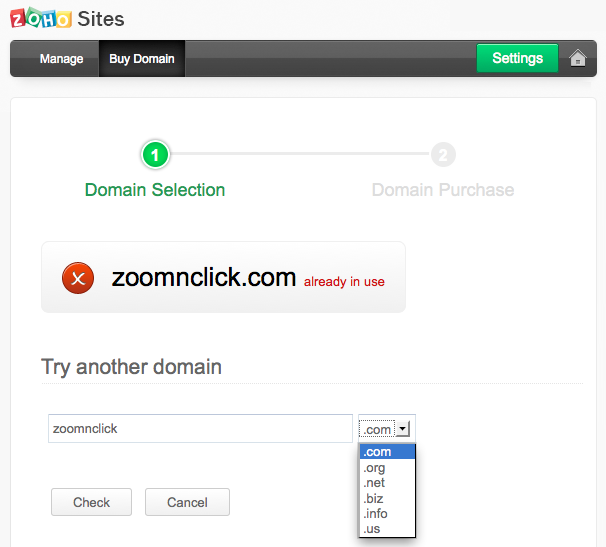 With Zoho Sites you can map a domain to your website in three ways. Zoho Sites provides you a free subdomain for instant publish, your website's name, suffixed by .zohosites.com. If you already own domain that was bought elsewhere, you can use it with Zoho Sites. Enter the domain name you already own in the text box that appears after you choose 'Map your existing domain' option, and follow the on-screen instructions. Then you need to map your domain to Zoho Sites, in order to view your website online. We have detailed instructions on domain mapping available here. How to map your domain? If you know about DNS configurations and want to do it yourself, you may follow the steps provided below. Otherwise, we suggest you to seek help from your domain provider. 1. Create a CNAME Record with the host name 'www' and point it to zhs.zohosites.com. 2. Forward your root domain 'yourdomain.com' to 'www.yourdomain.com' (domain name with www). Your domain provider would have provided you an administrative console to manage and configure your domain. Administrative console's user interface may vary depending on the domain provider, but following basic steps are similar. 1. Login to your domain provider's administrative console. 2. Go to DNS Settings section. 3. Search for Forwarding option and click on the link to set domain forwarding. 4. Forward the domain name (domain name without www) to www.yourdomain.com (domain name with www) and save the changes. 5. Go to DNS configurations / Manage DNS section, add a "CNAME Record" with the host name "www" and point it to zhs.zohosites.com. 6. Save the changes and logout. If you face any issues in mapping your domain name to Zoho, you may contact your domain provider support team, provide them with the steps given above and have them assist you. Usually these changes come to effect in 10-15 minutes, however in some cases it could take up to 48 hours. You can purchase a new domain from Zoho at the time of publishing your website. When you purchase a domain through Zoho, it will be configured automatically and mapped to Zoho Sites. The first step involves checking the availability of your preferred domain. If the domain you tried is not available, you can try another domain name. 2. If your preferred domain is available, simply follow the on-screen instructions. Multiple domains can point to the same website. Only one can be primary, others will be secondary. All the users who access the secondary domains will be redirected to the primary one. You can configure any domain as primary domain of your website. 1. Access the domain settings page. All your domains will be listed, with a toggle button beside. 2. Use the toggle button to switch between primary and secondary. 3. Whenever a secondary domain is made primary, the primary domain will automatically be made secondary. 1. A website can have only one primary domain. 2. Of all the domains pointing to your website, only one Zoho Sites sub-domain is permitted. Other domains have to be your own domains. 3. A primary domain cannot be deleted. Any other domain must be made primary, so that the existing primary domain becomes a secondary domain, after which you may delete it. 4. If there is only one domain added to your site and if you would like to delete it, you may add a Zoho Sites sub-domain, switch the sub-domain as the primary domain, then proceed to delete the intended domain.